Making 1st birthday cakes is a joy for parents and relatives because it's a way to celebrate a relatively new life and the happiness that it brings. The cakes don't have to be complicated or fancy because the focus will be on the birthday children and visiting with them. Even though most kids won't be able to remember their 1st birthday cakes or parties when they grow older, gathering with family members and friends is a way to demonstrate a commitment to loving and support those children throughout their lives. Remember, when you're making a first birthday cake, it's like giving a gift: the thought counts more than the final product. So even if you're only a beginning decorator, just give it your best shot! Most kids will be happy to eat anything you make for them. A number cake is a classic choice, and it's especially easy for first birthdays. If you choose to try it, you'll end up with some excess cake that you can frost and serve separately or use to make cake balls. Bake a 13 by 9 inch rectangular sheet cake, and let the cake cool completely. Wrap the cake tightly in plastic wrap, and freeze it for 15 to 25 minutes or until it is firm and chilled. Use a long, serrated knife to cut a large number "1" shape in the middle of the cake. Set the unused cake aside and store it for other recipes or later serving. Brush as many crumbs off the cake as you can. Frost the cake with a crumb coat, and refrigerate or freeze it briefly until the frosting firms. Use your preferred color of buttercream frosting to cover the cake completely. Smooth out the frosting with a flat spatula. Add a border, sprinkles, candies, a birthday message additional colors of frosting, and any other embellishments you desire. 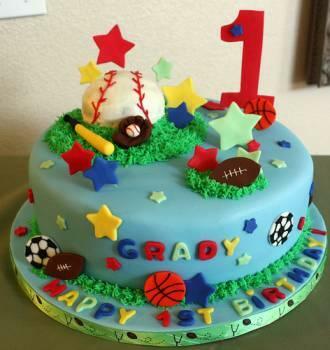 See pictures of more first birthday cake ideas. If you have a precocious child on your hands who is already displaying an interest or talent in a particular subject area, it can be a lot of fun to create a corresponding themed cake for her birthday. Themed cakes are a particularly good choice for intermediate or advanced decorators because they'll have the challenge of creating figures or details with frosting.Design your own themed cake or search through galleries of designs that other people have created for ideas. First, pick a topic for the cake. If your daughter loves ballet and wants to be a ballerina, for example, you might consider using pink and white fondant to craft a ballerina figure and placing it atop a simple white cake. If you know a boy who's really into superheroes, you can shape one of his favorites from fondant and sit it on the edge of the cake you make. Sometimes, you can purchase ready-made colored fondant that is ready for you to shape. If you make your own fondant or buy the white variety, though, you'll need to tint the frosting yourself. Wear plastic gloves, and knead gel coloring into the fondant until it's fully incorporated. Then shape the fondant as you would normally. When you're making a themed cake, don't limit yourself to frosting as a decorating medium. You can also use candies, fresh fruit, homemade cake toppers, and more. 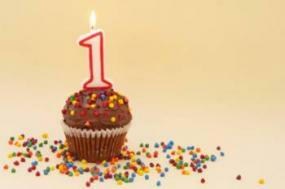 If the idea of decorating an entire large cake intimidates you, try making 1st birthday cupcakes instead. They're naturally fit for single servings, and they're a big hit with kids of all ages who are invited to the party. Cupcakes are just as versatile as large cakes, and you can decorate them in very similar ways. No matter what kind of cake you choose to create, you can enjoy sharing it with a child who means very much to you on his or her 1st birthday.